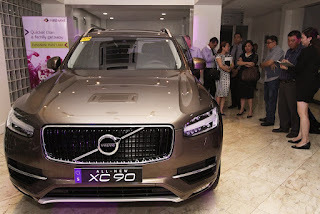 Volvo Philippines, in partnership with EastWest Bank and Diageo Philippines, held an exclusive VIP clients’ evening to offer their appreciation to the bank’s most elite clients. Held at the Volvo Philippines showroom, guests were welcomed by EastWest Bank Chief Operating Officer Mr. Jose Emmanuel Hilado and were treated to an evening of exciting cars, gastronomic delights and lively entertainment. Beautifully transformed into a lifestyle lounge area, the elegant Volvo showroom welcomed esteemed EastWest Bank guests with scrumptious fare prepared by chef extraordinaire Chef Rolando Laudico. Unlimited Johnny Walker Gold and Blue Label whiskey flowed, and specially prepared cocktails with limited edition spirits were also passed around courtesy of Diageo Philippines. They also provided a whiskey tasting and appreciation session with Ms. Lori Linsey and Brand Ambassador Mr. Rian Asiddao. Providing more insight into the current bullish Philippine market was Mr. ND Fernandez from PhilEquity, giving guests a more exclusive look into possible profitable investments. Mr. Chris Lee Yu also gave the guests a more in-depth tour of new and upcoming Volvo products, especially the All-New Volvo XC90. A live band provided a more lighthearted air as guests milled about, getting up close and personal with the Volvos on display. Guests went home with plenty of prizes, with lucky raffle winners getting their very own Limited Edition, name-engraved Johnny Walker Platinum Label or Blue Label bottles, as well as premium Volvo and EastWest merchandise. Fortunate guests also won weekend drives with a Volvo, getting a chance to experience the immense joy of being behind the wheel of one of the world’s safest, most exciting cars.